When it comes to designing and manufacturing safe and reliable vehicles, there are few automotive brands that do a better job than Toyota. Toyota has been manufacturing some of the very best vehicles in the industry regardless of class. Whether you are searching for a car, truck, SUV, crossover, or hybrid, Toyota has an option for you and it is, most likely, one of the best options in the class. Due to Toyota’s commitment to excellence in every vehicle they release, many of their vehicles have a long lifetime. 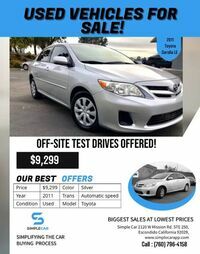 As a result, the used vehicle marketplace is full of excellent Toyota models for customers to explore. 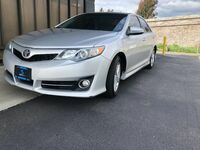 If you are interested in exploring a quality pre-owned Toyota vehicle, then you should strongly consider investigating the excellent pre-owned Toyota vehicles we have available at Simple Car near San Marcos, CA today! If you are interested in exploring the Simple Car inventory of Toyota models, then you should contact our staff today! Our team is happy to help you find the right pre-owned vehicle for your situation. Visit our dealership near San Marcos, CA today!